Welcome to the first installment of the Elvis in BRAVO chronology! 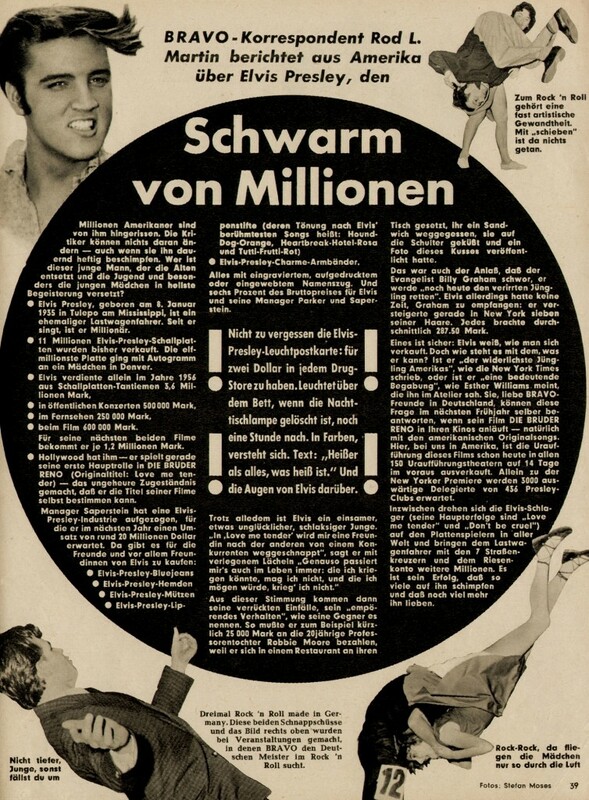 Elvis in BRAVO Magazine (Germany, 1963) can be found HERE! 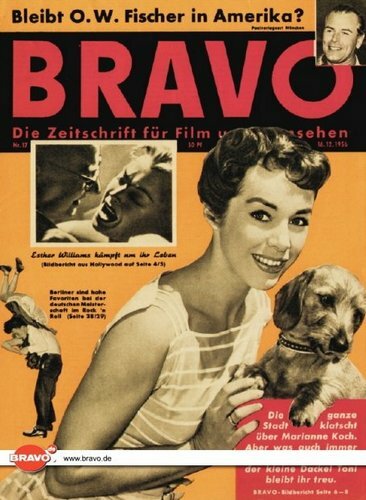 BRAVO was (and in fact still is) the most popular weekly Teen Magazine that was published in the German speaking territories. Among Elvis-fans, BRAVO became known for it’s many covers with, and articles about, Presley. Especially while Elvis was stationed in Germany he seemed to appear in just about every edition of the magazine. 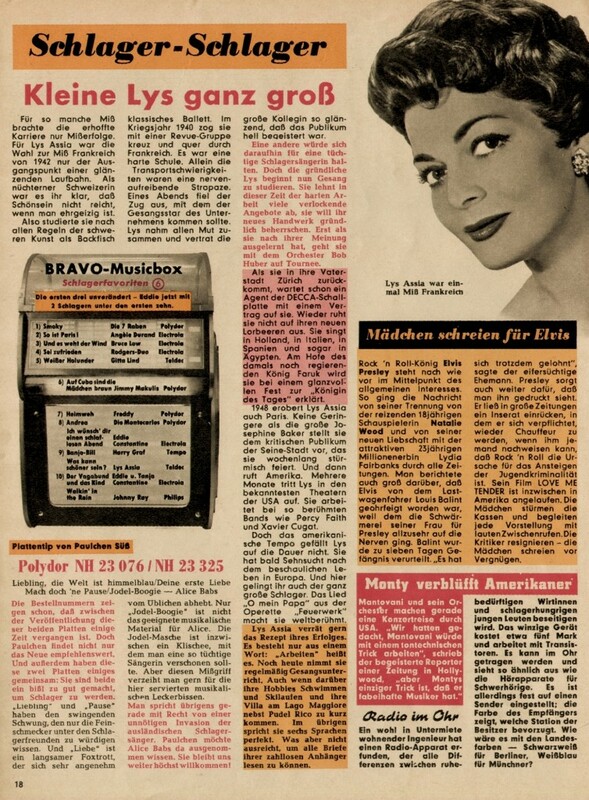 The very first BRAVO (see the image to the right) hit the newsstands on August 26, 1956. Marilyn Monroe was the most eyecatching star on the colorful frontcover. 30.000 copies were printed, a number that would be multiplied five times by the end of 1957. 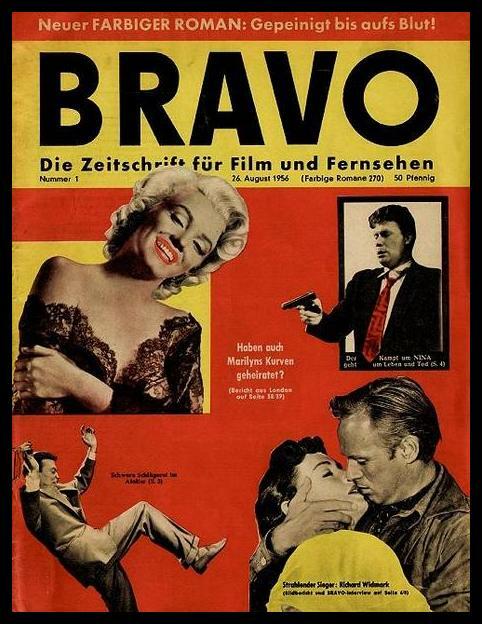 BRAVO presented itself as “The magazine for Movies and TV“, and this explains why someone like Richard Widmark (not your average teen’s favorite) would be included on the cover of the premiere issue. The German teens were clearly not (yet) the target audience for BRAVO. During the rest of that first year, nearly all BRAVO covers showed images of multiple stars. From January ’57 onwards only the face of one person (or at least of a certain duo or trio) would grace the frontcover. The first time that Elvis’ image appeared on the cover was in the last issue of 1956, nr. 19. 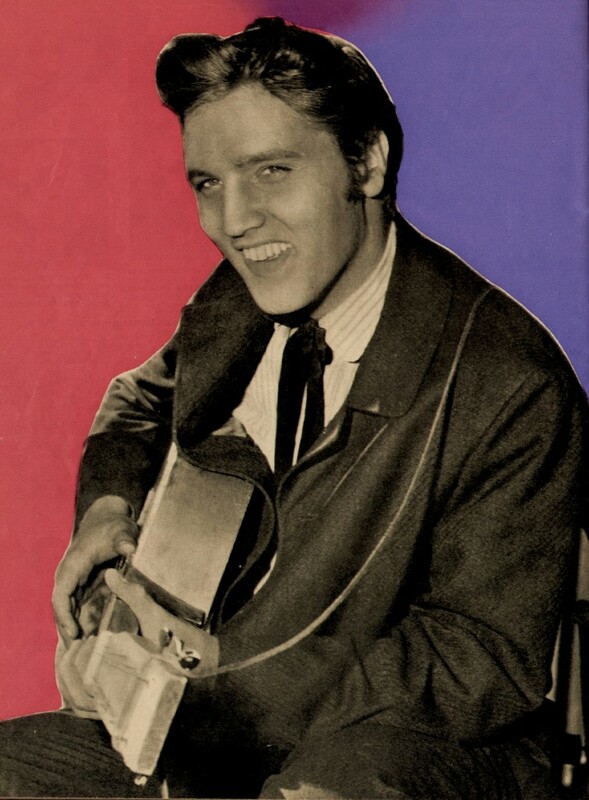 And Elvis’ first solo frontcover would be the nr. 7 issue in February of 1957. 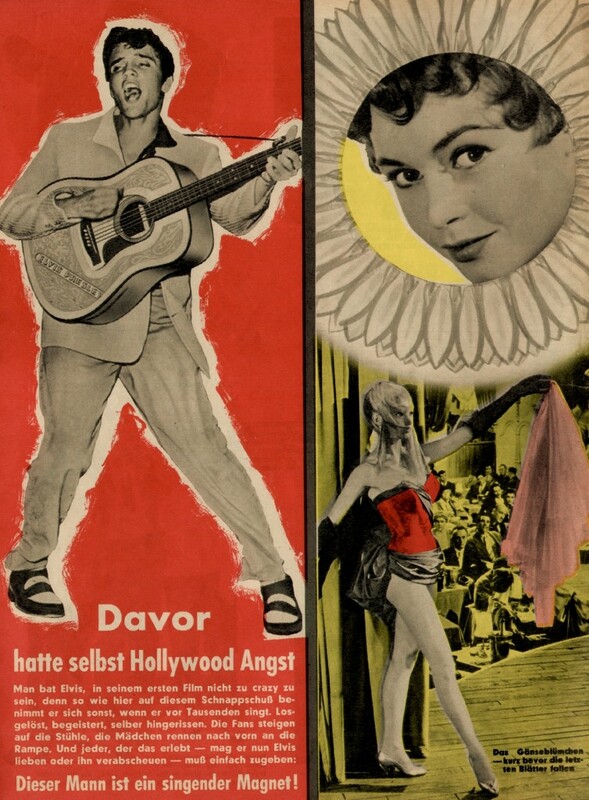 Now, let’s take a look at what BRAVO had in store in 1956 for the German Elvis-fans! We can see that James Dean was on the cover of this magazine. 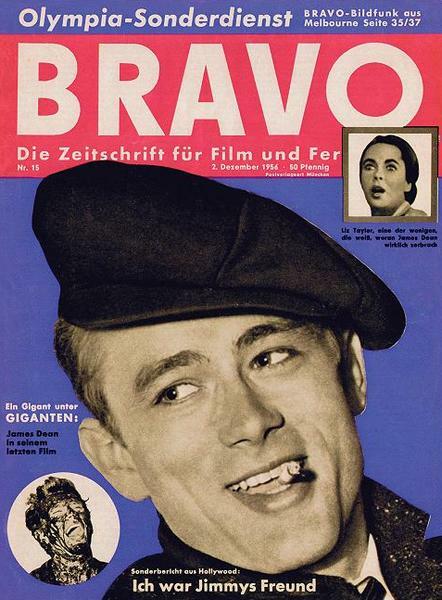 While most of BRAVO’s covers in the 50’s featured German celebrities, Dean holds the record with 9 covers between 1956 and ’59. Elvis was ‘only’ on 7 covers. In this issue BRAVO published it’s first fullpage article dedicated to Elvis. And they did not exactly portray him in a positive light. The focus is strictly on Elvis’ commercial value since all sorts of the nasty moneymaking strategies are presented here. Next to the height of the pricetags for booking Elvis, as well as many examples of the endless flood of EPE merchandise, we can also read that Elvis is a “lonely and unhappy boy” who “auctions off his own hair at DM 287 a piece“. 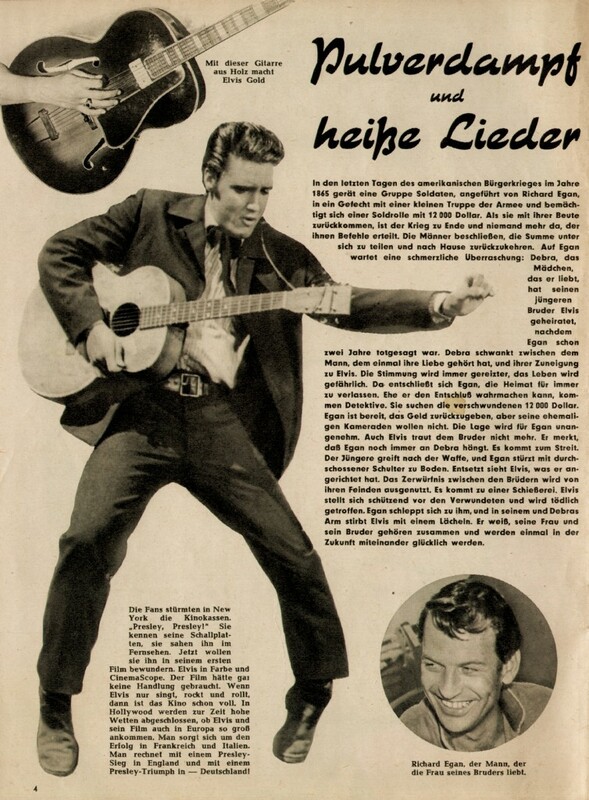 Also in this magazine, we can find a fullpage publicity shot from Love Me Tender. First Elvis’ breakup with Natalie Wood, and also his new love Lydia Fairbanks (the Paris Hilton of her day?) get a mention, before we learn that a jealous truckdriver named Louis Balint has punched Elvis in the face after his wife could not stop talking about Presley. BRAVO goes on to report that Elvis is very cleverly keeping himself even more in the headlines by having an ad printed in large newspapers in which he challenges everyone to prove that his music is causing juvenile delinquency. If proven as such, Elvis promises to go back to driving a truck. The premiere of his first movie closes the short article: the critics keep their mouths shut while the girls continue the screaming. 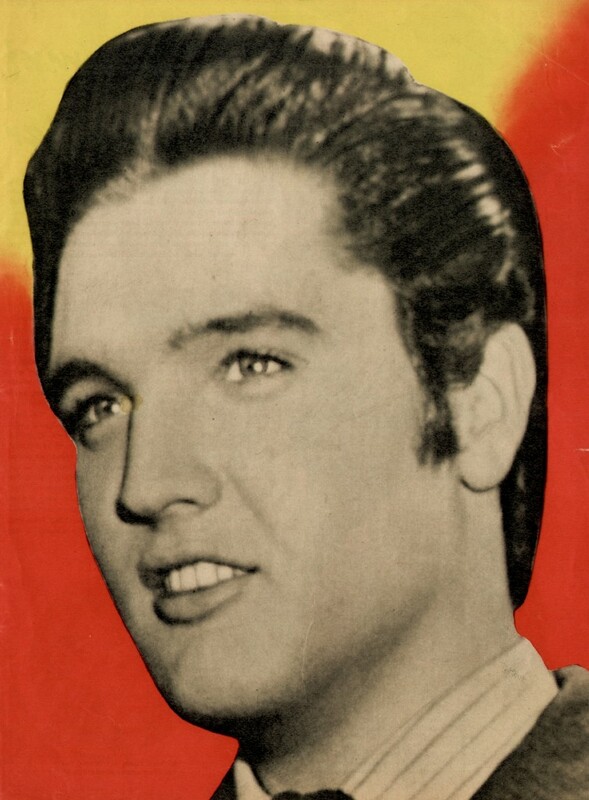 The last issue of 1956 was the first that had an image of Elvis on the frontcover. It was also the first issue that had a 2-page Elvis Presley spread. Since BRAVO started out as magazine devoted to movies and TV, it makes perfect sense that not until the release of Love Me Tender, Elvis hardly got a mention in the mag so far in 1956. The German title of the movie always struck me a bit odd. But at least it made perfectly clear what to expect: action + music. In the 2-page article we can read the storyline of the movie. And the captures that accompany the images make it a clear that Love Me Tender is not just a movie but rather an Elvis-vehicle. Noteworthy is that the article assumes the movie will be in Color and CinemaScope. Also in this issue a halfpage photo of Elvis. The text mentions that Hollywood is “afraid” of Elvis, hoping he will not move in the same way that he usually moves on stage. The words at the bottom read “This man is a singing magnet!“. 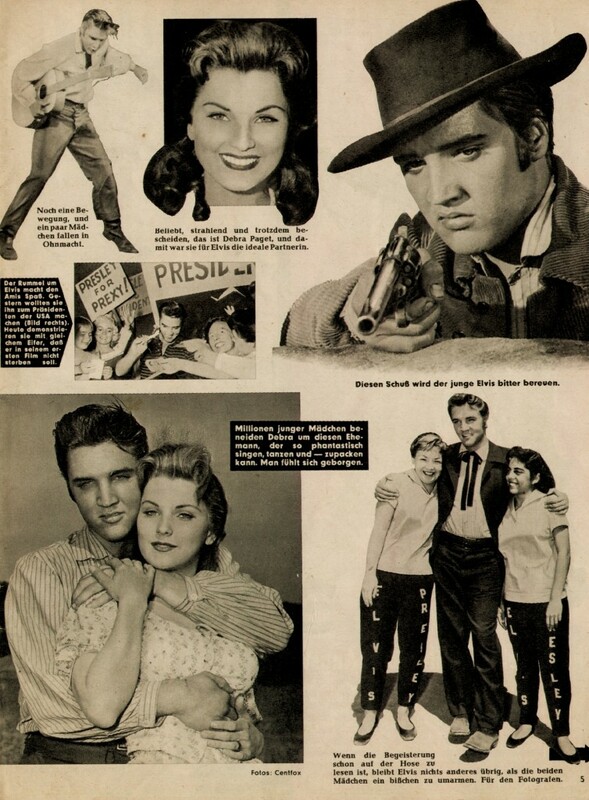 And if all this wasn’t enough, a fullpage portrait of Elvis was also published in the final issue of 1956. With the exception of one (the ‘tonsil-photo’), all images used by BRAVO in 1956 are from Love Me Tender. Great work, Bob ! A very interesting feature. I still have a glorious Elvis poster published by “Bravo” in the early 80s featuring that great and classic photo taken in Florida, August 1956, where he’s leaning backwards onstage standing on his toes – and sepia-tinted, no less ! 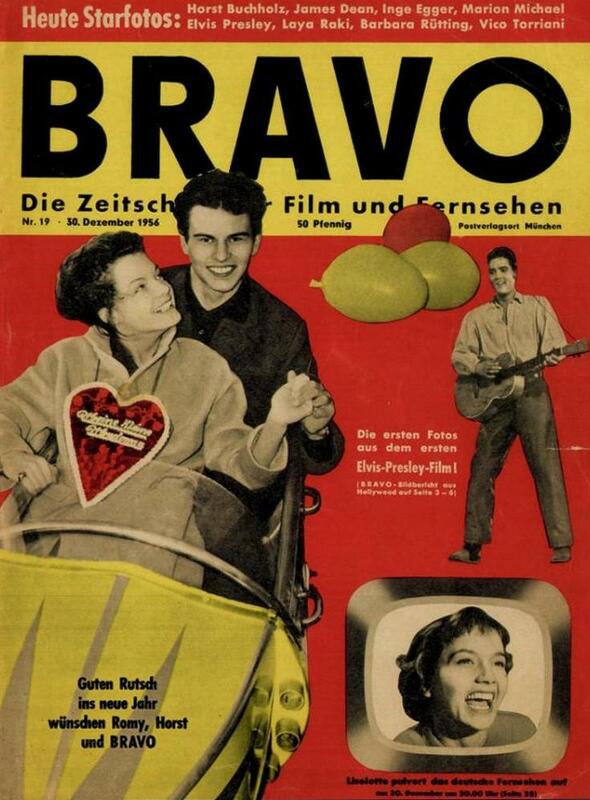 Great article about the early German magazines BRAVO.